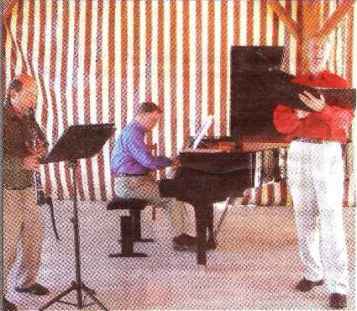 Shrewsbury – The new Arts on the Green season begins Saturday, Sept. 24, with “A Dessert Soirée” with the Orliac Trio. The event starts at 7 p.m. at the First Congregational Church, 19 Church Rd, Shrewsbury. The opening event of the 2011-2012 season, “A Dessert Soirée” features clarinetist Chester Brezniak, bass-baritone Robert Osborne and pianist Malcolm Halliday in a wide-ranging and entertaining program, from Schubert and Brahms to Ellington and Gershwin, accompanied by delicious desserts. Admission is free, with a suggested donation of $10 adult and $5 children and students. To find out more, visit www.fccsm.org.